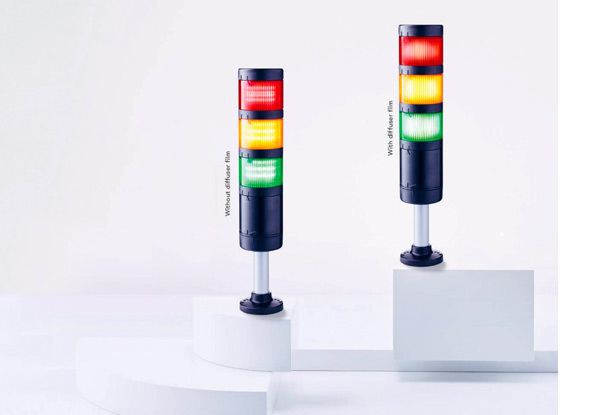 Signal towers and signal pillars are important visual and auditory signaling devices for use in machines or in automation processes. Signal towers and signal pillars are also known as totem poles or status columns. The color or state of the signal tower indicates a certain command. Standard signal towers and signal columns are equipped with a buzzer. Auer Signal is a technology leader in the field of optical and acoustic signal devices such as signal towers, signal lights, buzzers, horns and sirens. Modular signal towers are available in several variants as surface mounted, wall and panel mounting versions. Optical, acoustic and optical-acoustic models are also available. Modular signal towers are available with corner mounting, tube mounting, floor mounting and wall mounting elements. The Modul Perfect 70, or PC7 for short, is one of the most versatile signal towers. The signal tower is up to 6 times brighter than the competition and up to 13 times brighter than the previous model Modul-Signal 70. With 7 positions is the PC7 one of the most versatile signal towers. The unique, patented contact allows up to 7 positions thanks to 8 internal contacts. The upper module is even brighter than the standard light modules and has an extensive, hemispherical signal effect. The diffuser films can be placed effortlessly in each individual module, even at a later time. Read more about the Modul Perfect PC7. The M12 connector base is the perfect solution for applications where fast, simple and cost-effective installation of the signal tower a top priority is. 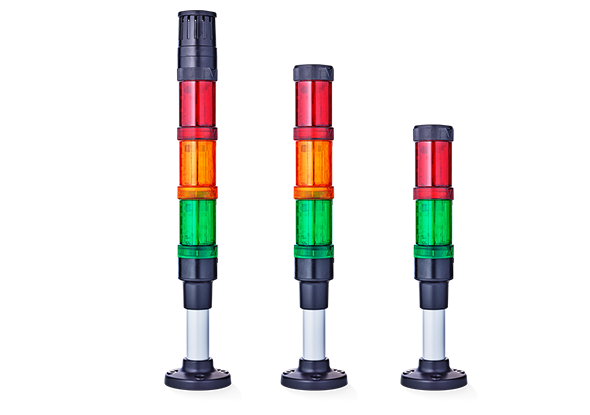 Modular signal lamps and signal towers make is possible to see and hear the status of a specific machine or technical installation from a distance. Modular signal towers can be equipped with optical, acoustic and optical-acoustic signaling modules. The ECOmodul signal tower from Auer Signal has many different mounting options, so you can assemble the signal tower exactly as you wish. The ECOmodul signal tower uses very bright LED technology. The modular signal tower is equipped with optical modules and a buzzer for acoustic safety functions. The connection is very simple, namely via a spring pressure of push0in technology. View ECOmodul signal towers. The modular signal tower Half-Dome for wall mounting from Auer Signal is a high-quality signal tower for universal applications, such as installation on walls or directly on the machine. With a high protection class of IP65, the Half-Dome signal tower is suitable for both indoor and outdoor usage. The signal tower has a special lens optic with a reflective coating for optical signaling and visibility from any viewing angle (180°). The modular signal tower has a maximum of six modules, five LED modules and one buzzer (70-90 dB) in the upper enclosure area. Read more about the modular signal tower Half Dome from Auer Signal. The ECOmodul 40-series of Auer signal with a diameter of 40 mm is the smallest modular signal tower series in the world. 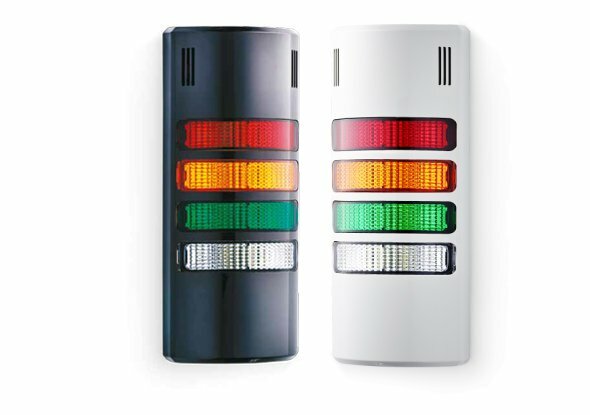 Only the Ø 40 mm signal tower of the ECOmodul series is available with an LED multi strobe or multi color strobe. You can choose from pre-assembled towers or you can put together your own signal tower with both optical and acoustic modules (80 dB). The 40 series can withstand temperatures of -30 °C and + 60 °C. The signal tower has a maximum of 5 modules or 10 modules using a double bracket. 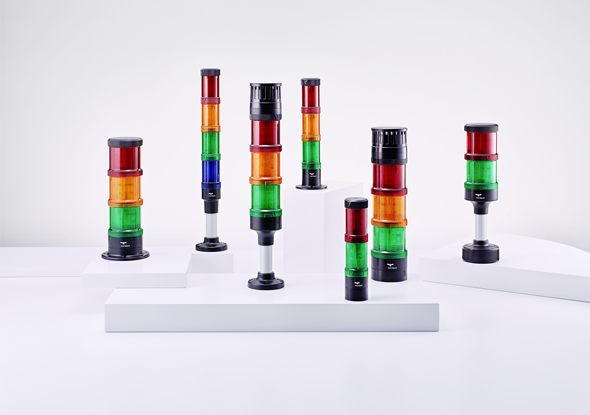 Read more about modular signal lights and signal lamps. The ECOmodul signal towers are available with different diameters: 40 mm, 60 mm and 70 mm.